1 Put the game board and the agora in the middle of the table. Note: although the tiles of the game can make up a 'correct' map of our world, there's no need to do that in this game! 3 Sort the building cards by Era (I, II, III, IV) and place them face down in four separate decks next to the game board. Note: In a 3-player game remove all building cards with '4+' from the game. In a 2-player game remove all building cards with '3+' and '4+' from the game. 4 Sort the wonder cards by Era (I, II, III, IV) and place them face down in four separate decks next to the game board. 5 Sort the civilization cards by Era (I, II, III, IV) and place them face down in four separate decks next to the game board. 6 Shuffle all history's judgement cards and draw five random cards. Place these cards face up next to the board. Put the remaining cards back in the box, these won't be used this game. 7 Shuffle all future technology cards and place them in a face down deck next to the game board. 8 Shuffle the glory tiles face down next to the board. 9 Place all Gold next to the game board, forming the general reserve. 10Each player chooses a color and takes the corresponding components: player board, technology tiles, capital, colonists, cubes and score marker. The score marker is placed on space '0' of the score track on the game board. Players put their player board in front of them. 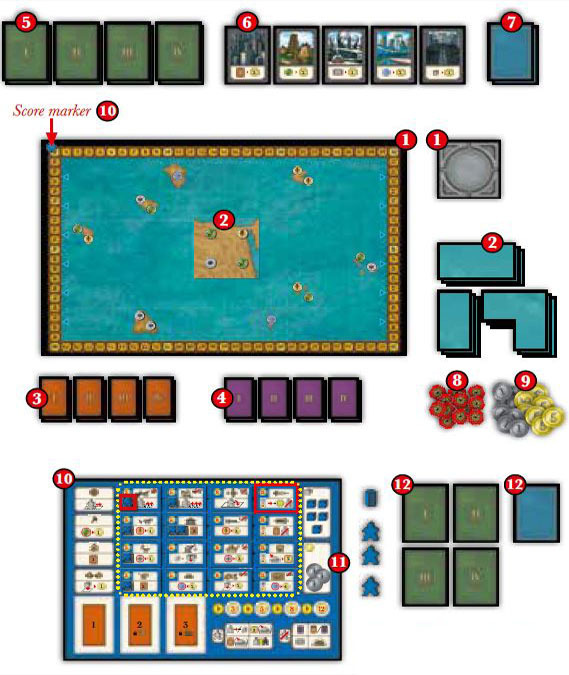 (See page II for detailed setup of the player board). 11 Each player takes 3 Gold and places these on the Gold space on his player board. The amount of Gold a player owns is public information during the game. 12 Each player takes 4 civilization cards (one of each Era) and l Future Technology card and places these without showing them to the other players face down in front of him. Put all unused civilization and future technology cards without looking at them back in the box. The Player Board is the center of your game experience. It will show you all the available technologies at your disposal, contains the building spaces, invasion track and an overview of the available actions. Place the technology tiles on the corresponding spaces on the player board. 7 cubes are placed on the designated cube spaces on the technology tiles. The remaining 5 cubes go to the reserve space on the player board. Reveal all the wonder cards of the current Era and place these face up next to the game board. Reveal a number of building cards of the current Era equal to the number of players and place these face up next to the game board. Example: in a three-player game, three cards are revealed. The other piles will be revealed in the approriate Era. Starting with the first player and followed by the other players in clockwise order, each player reveals his civilization card of the current Era and chooses if he wants to keep his civilization card from the previous turn or the card from the current turn. He then discards the other civilization card. Note: In the first round, skip this phase; every player simply reveals his first civilization card. Important: The immediate effects (lightning sign) a card may provide must be applied directly after a card has been chosen and can only applied once even if a player keeps the card in the next Era. The permanent effects, however, stay in effect until the civilization card is discarded. 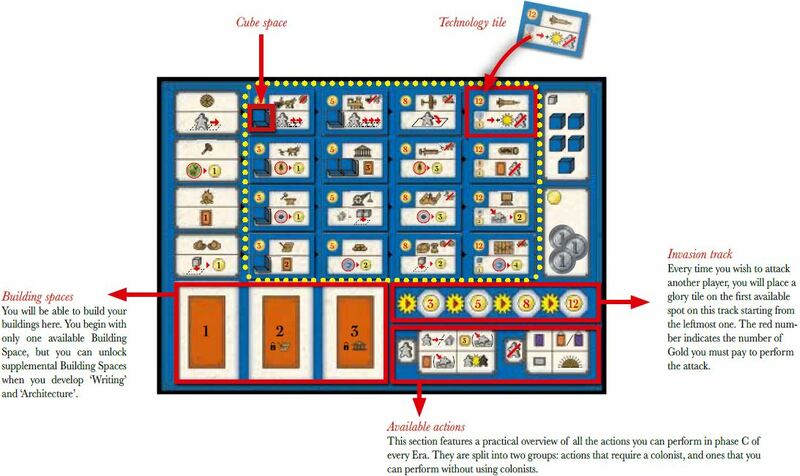 The player who ends up having the civilization card with the lowest number (in the upper right corner) becomes the first player of that Era. The player draws a continent tile and places it on the game board. Important: In the first Erayou must place a continent tile with three squares. In all the following Eras you must place a continent tile with two squares. In the first Era the player must place his capital on a square on his just placed continent tile with the active side up (the empty side). He then moves the three colonists in his reserve to this square. He places his capital in the middle of the square, covering up the resource symbol (and thus making the resource unavailable to all players, including himself!). 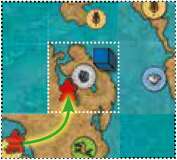 In the following Eras each player may move his capital to a square on his most recently placed continent tile. When a player does so, he must move all the colonists that are still present on the square where his capital was placed to the new capital location. Important: A player must always either place his capital on the tile he just placed or leave it standing on its current location. Example: In his first Era, the red player placed his capital on the red highlighted tile A in the second Era, he places the green highlighted tile on the board B, and moves his capital marker on a square on the newly placed tile C, covering up the resource shown (rock) and thus making this symbol invisible to all players (every player considers this resource to be non-exitant until that capital is moved to another location). 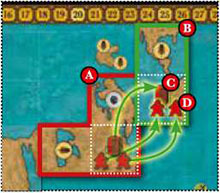 The red player must then move all the colonists present next to the previous capital location to the new one D.
Each continent tile must be placed adjacent to another already placed continent tile. Each continent tile must be placed within the grid. The continent tile can be rotated and placed in any direction. The conformation of the terrain must be respected (land touching land, sea touching sea). The edges of the map don't count in this matter. Meaning that if you place a tile with its sea side on one edge of the map IT IS possible to place a tile with its land side on the other corresponding edge of the map. A continent tile cannot be placed on top of another continent tile (inculding the sqaure continent tile). A continent tile can cover the islands printed on the map. Colonists on the covered spaces go back to their respective capital. This phase is the main phase of each Era. Each player, starting with the start player followed by the other players in clockwise order, must execute one action per turn until all players have started a Golden Age. A player can choose from eight actions in his turn. It is allowed to execute the same action multiple times each Era (except for 8. Start a Golden age: you can only perform this action once). This action consists of two separate actions: a) move a colonist and/ or b) found a city. You can execute either or both, but you must respect the order; you cannot move a colonist after you founded a city. The player chooses one of his standing colonist anywhere on the game board and moves it on the map. A colonist can only move horizontally or vertically. A colonist can move over the continent tiles and any space (land or sea) of the printed map on the game board. A colonist can enter, move over and end on a space occupied by any player's colonists, cities and/or capitals. At the beginning of the game a colonist can move up to one space. Certain technologies ('Carriage', 'Rail' and 'Aviation') increase this number. A colonist may exit the map through the left and right edges and reappear on the corresponding opposite side. A colonist may also choose not to move. If after the movement the colonist ends in a space with a resource symbol (game, wheat, rock or gem) on it and he didn't already have a colonist and/ or city there, he takes control of that symbol. Important: The red circle you find on certain cards and technologies around a Gem/Rock/Game/Wheat symbol indicates that you receive gold when you take control of this resource; this happens when you move a colonist on a space containing one or two resource symbols and/or found a city there. If there is a simple black circle round the resource, it indicates you control a resource; meaning you have a colonist or city already standing on that space. The control of the same resource can even be shared between different players, e.g 2 colonist and 1 city of different players. It is not possible to have cities of different players on the same square. Do note as previously mentioned that when there is a capital on a square, it covers the resource completely: no player has or can take control over that resource. Example: the blue player has a city on a space with a rock. The red player moves a colonist to the same space. Both players now share the control of the rock. However, if the red player wants to found a city here, he must attack the blue player. The player takes Gold according to which technologies a player has developed and/or which cards he may have. After moving the chosen colonist (or not), if the colonist is standing on a continent square without cities or capitals, the player may found a city there: he places one cube (or two cubes if he has developed 'Construction') from his reserve on the space. If a player doesn't have enough cubes, he must take the missing ones from anywhere on the map. For each placed cube the player gets Gold. The amount can vary depending on which technologies a player has developed and/or which cards he may have. Cubes vs cities: You must understand the difference between 'cubes' and 'city' in these rules and the player aid. A 'cube' refers to the actual wooden cube on the map or your player board, a 'city' refers to the one or two cubes that form a city on the map! You may only found cities on continent tiles. It's forbidden to found a city on the islands printed on the map. At the end of the explorer action, the player lays down the used colonist. Example: The blue player moves a colonist to a wheat symbol . Since he had developed Agriculture', he gets one Gold. Then he founds a city , getting one more Gold (because he has 'Barter'). Finally, he lays down his colonist. The player takes one of his standing colonists anywhere on the game board and lays it down on the agora. Then he takes one face up building card from the table and places this on a free building space on his player board. At the beginning of the game each player can only use building space 1. Developing 'Writing' and 'Architecture' unlocks additional building spaces. If no free building space is available, the player must discard a building from his player board. This building is removed from the game. It is allowed to have duplicate buildings. The player takes one of his standing colonists anywhere on the game board and lays it down on the agora. Then he scores 3 victory points by moving his score marker on the score track. The player chooses one of his standing colonist anywhere on the game board and may moves it on the map to a space that contains one or more colonists from his opponents and/or an opponent's city (capitals, however, can NOT be attacked). The rules for moving are the same as with the Explorer. 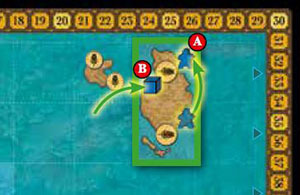 After moving (or not, the player can leave his soldier on the same spot), the player pays the amount of Gold indicated by the leftmost free space on his invasion track to the general reserve. Important: the number of Soldier actions a player can execute each game is limited to four. The cube(s) of the opponent go back to that player's reserve. All opponents' colonists on this space go back to their owners' capitals (if they were still standing, they remain standing). 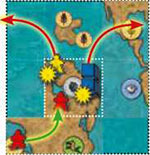 The attacking player takes one random glory tile and places it face down on the first free space on his invasion track. Afterwards, the attacking player may immediately execute the action 1b) Found a City. As a final step, he lays down his colonist. Example: the red player decides to attack the space where the blue player has a city (with two cubes since he has developed 'Construction'). He moves his colonist, and pays 8 Gold since he has already attacked twice this game. Blue has to remove his city cubes and place them back on his reserve, and Yellow must remove his standing colonist and place it back next to his capital. Note: If a player had developed Rocketry, he doesn't need to move a standing colonist to attack. The player chooses one available wonder card, pays the indicated costs in Gold and places the card next to his player board. Some civilization cards reduce the cost for the player holding that card. Execute the instant effect ( ) on the wonder card immediately after building, if applicable. There's no limit to the number of wonders a player can build. 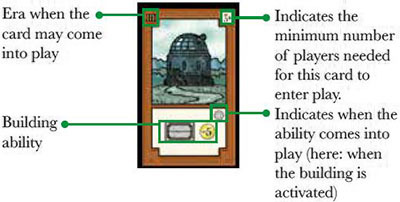 The player chooses one of his buildings or wonders with the activation ability He executes the indicated power and flips the card (to show the power has been used this Era). You can only use the power on each card once each Era. The player chooses a technology to develop. He pays the indicated costs on the tile and places the tile face down next to his player board. Any cubes present on the tile go to the player's reserve. The new technology's benefit applies immediately. Some technologies make previous ones obsolete: when you develop the new one, you lose the benefits of the old one. Important: To develop a technology the previous one in the same row (as indicated by the arrows) must be developed already. Example: In order to develop 'Construction', 'Me3allurgy' should already have been developed. 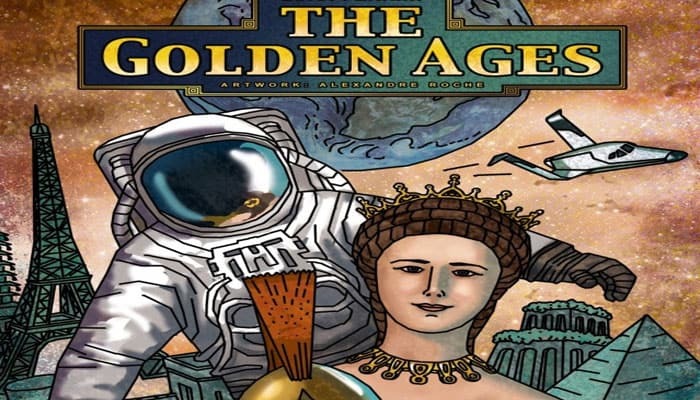 If a player has no standing colonists on the game board, he may start a Golden Age. This means he passes and cannot perform any other actions this turn. Each time the player should be taking a turn, he gets 2 Gold from the general reserve. Important: The player doesn't get any money when he starts his Golden Age. 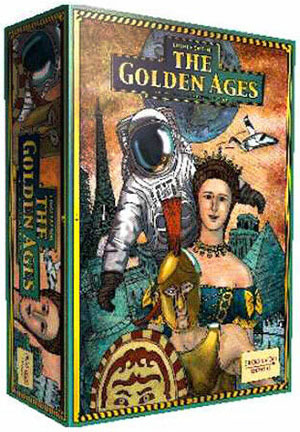 To start his Golden Age, the player flips his capital to the Golden Age side (the side with the sticker). The first player to start a Golden Age during the current Era chooses a "History's Judgement" card and places it next to the agora. When all players have started a Golden Age, the Era ends immediately. Exception: The end of the fourth Era is triggered after the first player starts a Golden Age (see End of the game). All players score victory points according to the 'History's judgement' card on the agora. Note: Skip this phase at the end of the fourth Era. Discard building cards and wonder cards which weren't build in this Era. Discard the history's judgement card next to the agora. Place these cards back in the box. Flip all capitals active side (blank side) up. Place all the colonists on the map upright. They all remain in place. Take all colonists from the agora and place these upright on the square with their owner's capital. When a player starts a Golden Age during the fourth round/Era, it is the last turn. After him all other players have a single last action. The game ends with the turn of the player right of the player who triggered the end of the game. The chosen History's Judgment card is normally resolved, then the game ends. Gold: 1 VP for every 3 Gold. Developed technologies: the VPs on the back of the technology tiles next to his player board. Glory tiles: the VPs on the glory tiles on his invasion track. Future technology card: Each player reveals and scores his future technology card if he has achieved the prerequisite. The player with the most VP is the winner. In case of a tie, the tied player with the most cities on the map wins. If a tie remains, victory is shared.